Noles247 reported on Monday afternoon that linebacker Adonis Thomas will be transferring from Florida State. Thomas was a former JUCO player who joined the team in the 2017 recruiting class after previously playing at Alabama. His first season in 2017 was nothing much to write home about. Thomas played in just five games despite being brought in for immediate help at the position. He struggled with physicality and did not impress with his run defense, although he had the speed to be a decent coverage linebacker. The hope was that he would be reinvigorated with a new staff in the 2018 season. The Seminoles had a glaring weak spot in the middle of the defense that Thomas was supposed to fill. Instead, it became clear by fall camp that Thomas was not a legitimate long-term option. He started the first two games of the season before being benched. He finished 2018 with 16 tackles and one quarterback hurry. Thomas will only have one year of eligibility remaining. From a roster standpoint, this transfer helps Florida State by clearing up a spot for the 2019 recruiting class. 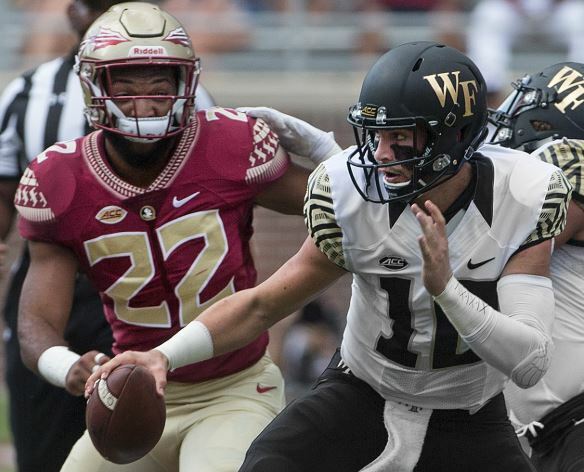 The linebacker position is still a huge question mark for the Seminoles in the coming season, but Thomas underperformed in his time at the university. He would not make a significant impact either way. Florida State is expecting a handful of transfers in the coming weeks. 5:30 p.m.: According to a report from Warchant, Thomas has chosen to stay at Florida State. Until we get an official announcement from Thomas himself, we will continue to update this piece.